How to make charcoal? It is a rather an unusual question because we can buy lumps of charcoal easily at our local hardware or grocery stores. However, I got interested in the process after discovering that not all charcoal pieces are the same, and also it takes a while to get the hang of controlling the heat you want for the perfect barbecue. Yes, I mentioned about a small charcoal factory in Terengganu but here is a detailed description of a full scale charcoal factory at Kuala Sepetang in Taiping. As you probably know, different types of wood will give out different flavor for your BBQ meats. 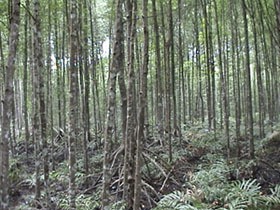 In Malaysia, mangrove is used for making charcoal. It is a common tree found in swamps, especially at river mouths. Interestingly, only thirty year old mangroves are harvested for the logs. It is also enlightening to know that to ensure continuity, those trees which were fell for charcoal making are being replanted. The Chemistry and Physics involved are quite elaborate despite the fact that charcoal is mainly used as fuel. As we all know, all living things have carbon as their main chemical component. Carbon dating is used to determine the age of ancient objects based on the half life radioactivity that carbon emits. Therefore, all living things can be turned into charcoal, including human remains! 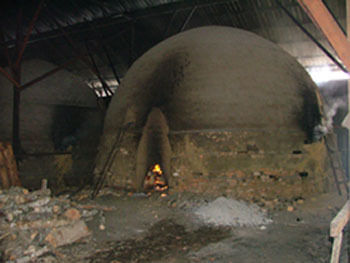 In order to make the charcoal, it is very important that the temperature of the kilns is controlled accordingly. Too high, the logs will turn into ashes, too low, they will not turn into quality charcoal that burn efficiently. The factory has come up with a practical way of transporting the logs from the mangrove forest. 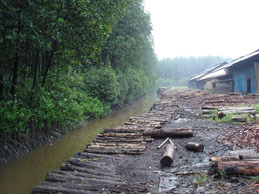 Instead of hauling the logs over uneven terrain, small canals are dug which act transporter when the tide is high. The water is fed from the river mouth. 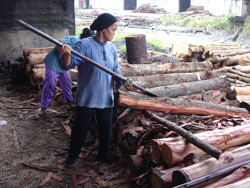 The logs are cut to about 1.6 meters in length and in uniform diameter of thirty year old mangrove trunks. Before turning them into charcoal, the barks have to be removed. The process is back-breaking, using a heavy, long chisel-like tool. The logs are then arranged in the kiln. They are arranged in such a way that the heat inside the kiln is evenly distributed to all the logs. 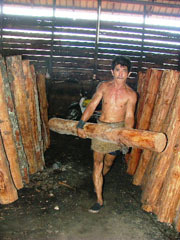 In this case, the logs are arranged vertically upright. The total time the logs spent in the kilns are about thirty days before they become quality charcoal. For the first ten days, roaring fire are used. More air is fed into the opening of the kiln. As they progress, air intake is reduced by sealing the opening of the kiln. Therefore the fire will be slowly reduced. Steam will come out of a vent at the top and is collected as a useful by-product. Finally, the logs are cured by sealing the kiln mouth altogether for a week. The temperature of the steam still smoking out of the vent will be used as an indication of the readiness of the charcoal. 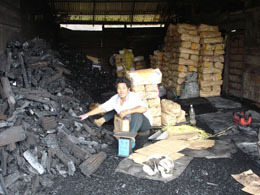 Charcoal that are made in this factory supplies the local market. However, they are also mainly exported to Japan. Some people swear that cooking certain food by charcoal enhances the flavor and imparts a unique taste. Isn't it interesting that now you understand how to make charcoal by this virtual visit to a charcoal factory?